The other day I was checking out the Manitoba Liquor Marts website for new products that are making its way to Manitoba. 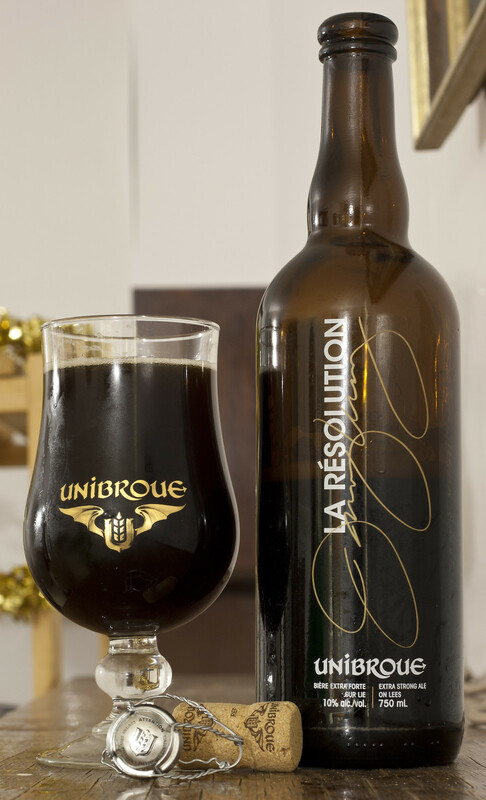 One of the products that was on the list was a beer called La Résolution by Unibroue, it didn't have any information about it except the cost and that it wasn't available yet. 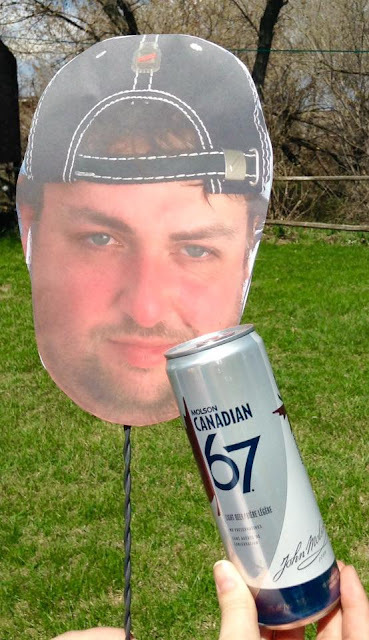 I searched all over the interwebz and couldn't find any information about the beer. 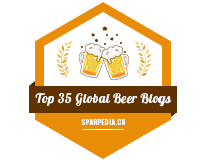 I ended up sending a message to Unibroue Sommelier asking him details about it, it told me about the style and that it was going to be launched in Quebec on October 3rd. October 3rd comes around and my beer buddy Jovan iMessaged me a picture of La Résolution! The bottle reminded me of a wine bottle: simple, the name of the beer and the brewmaster's signature on it. Pretty bland for Unibroue standards... but up close I found out that it's a painted label, which is NOT cheap at all compared to simply using a paper label to it. Unibroue's La Résolution's bottle notes state: La Résolution is a dark ale with spicy character inspired by a recipe our brewmaster Jerry Vietz created for his friends. At 10% alcohol, its spicy caramel aroma evolves on the palate into pleasant and complex notes of toffee with reminiscence of a tasty gingerbread. The perfect balance between spicy, caramel and roasted malt flavours is complemented by a nice roundness and persistent finish. The first thing that came to mind about this beer was "is this possibly a beer created off of the success of Unibroue 17 but without all the aging in oak barrels?" Appearance: La Résolution pours a thick dark black ale, akin to your standard Trois Pistoles or 17 Grande Réserve. Incredibly murky with a hint of a ruby red hue to it. The head is quite thick, creamy, beige and foamy, but by the time I was able to get one non-blurry photo - the head was all gone. Aroma: Nice sweet dark notes to it. Very much a Unibroue beer through and through. Notes of burnt caramel, a bit of nutmeg, dark fruits like prunes, a bit parfumic, light buttery notes and a sprinkling of gingerbread. The flavour cold from a fridge vs warmed up is incredibly different. The dark fruits are more noticeable as it warms up, while I find the caramel and gingerbread is more present at colder temperatures. Taste: A bit hard for me to drink when it's warm, which is rare for me as I can drink down a Unibroue pretty easily - the only beer I do have problems with drinking down is U17, so it's quite reminiscent of Unibroue 17 but this is its own beast. It has a creamy mouthfeel, a bit of a bitter alcohol bite to it, a light bitterness that's slightly reminiscent of oak - but it's more likely from the roasted malts more than anything, to give it off a hint of a roasted coffee bite. The creaminess I described before has a shot of ginger bread, reminiscent to the sweet & wintery stouts we see popping up starting in November, and even a bit reminiscent to the pumpkin ales that are all the rage right now. Other notes include dark fruits and a Belgian yeastiness. Overall Thoughts: Perhaps this beer is influenced by Unibroue 17 in some way, as it has notes that remind me of it a great deal, the heaviness, the roastiness, the darkness, but this is a slightly different Belgian ale than what Unibroue usually does, the addition of notes like burnt caramel and gingerbread is a first for Unibroue to me. This beer likely won't be sticking around for that long, I special ordered a case of 12 to age - and aging I will be doing! This beer will easily age like a fine wine.. er like a fine Belgian ale! As Unibroue's biggest fan, I approve!